With the canonization of John XXIII on April 27, 2014, it seems opportune to remind our readers of his close ties with Modernism to show how this act of Pope Francis is, to say the least, open to discussion. 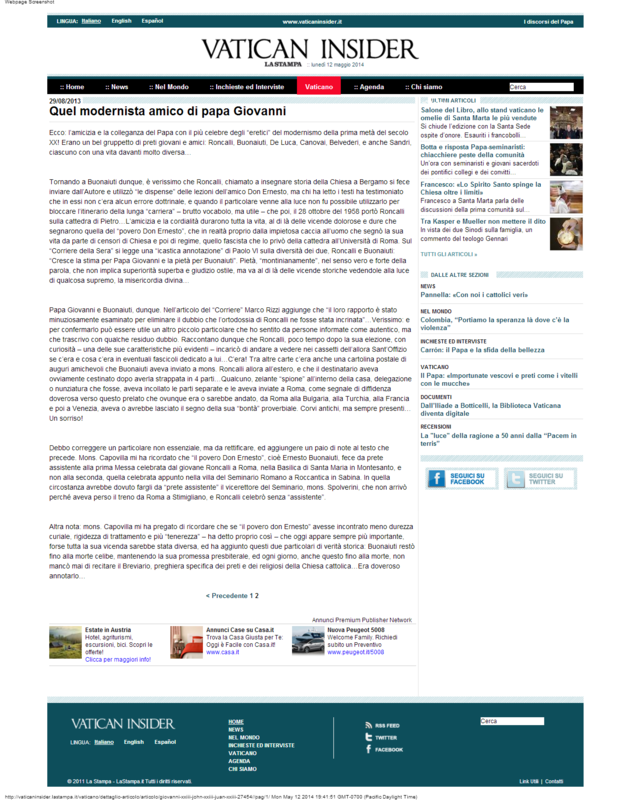 Below, we post the photocopies of an article by Gianni Gennari, published on August 29, 2013, which reports the close friendship of Angelo Roncalli with Fr. 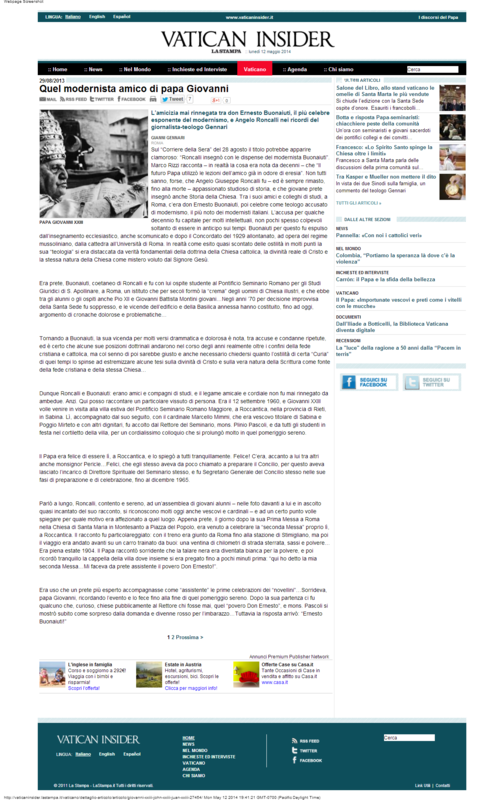 Ernesto Buonaiuti, the most notorious Italian modernist, condemned as such. 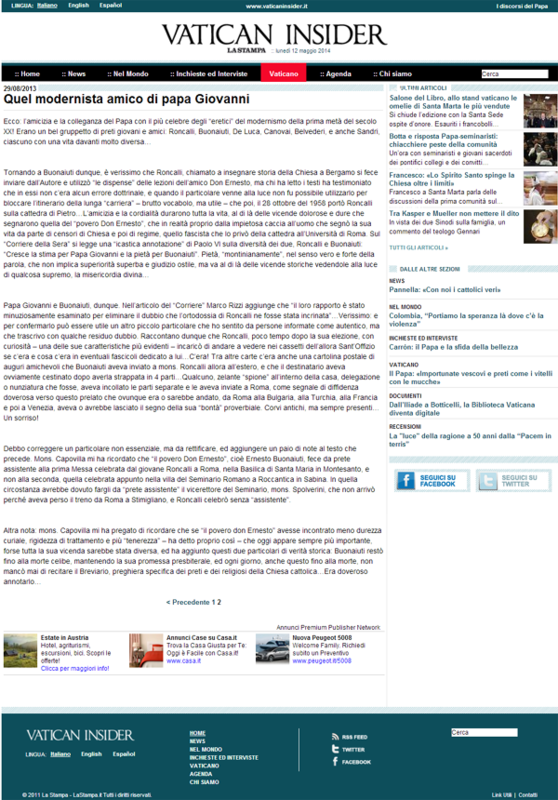 Although the article tries to present Roncalli as exempt from errors against orthodoxy, it is a document that demonstrates the same aims of both Roncalli and Buonaiuti. In times past, when the process of canonization was a serious matter, such a document would be sufficient to qualify Roncalli as suspect of heresy and, of course, halt any attempt to name him a saint. Also noticeable in the document is the intent to present Buonaiuti well and to denigrate the previous vigilance of the Church against Modernism. The title in the August 28  Corriere della Sera may seem sensational: "Roncalli taught with the lecture notes of the modernist Buonaiuti." What Marco Rizzi reports has in fact been known for decades - that "the future Pope used the lessons of his friend who was accused of heresy." Not everyone knows, perhaps, that Angelo Giuseppe Roncalli was - and continued to be until his death - a passionate student of history and, as a young priest, he also taught Church History. Among his friends and colleagues in Rome was Fr. Ernesto Buonaiuti - the best known of the Italian modernists - after he became famous as a theologian accused of Modernism. For several decades this charge fell on various intellectuals, who were often guilty only of being ahead of their time. For this reason Buonaiuti was expelled from teaching in the Church and also excommunicated. And, after the Concordat of 1929, through the influence of the Mussolini regime, he lost his chair at the University of Rome. In fact, as an almost predictable outcome of the hostilities, his "theology" deviated in many points from the fundamental truths of the doctrine of the Catholic Church: the real divinity of Christ and the very nature of the Church as a mystery willed by the Lord Jesus. Returning to Buonaiuti, his life is well known, developing through repeated accusations and condemnations – dramatic and painful in many aspects. It is sure that through the years some of his doctrinal positions went beyond the limits of the Christian and Catholic faith, but in hindsight it would be fair and necessary to question how much the hostility of certain ‘Curia” of those times led him to exaggerate some claims about the divinity of Christ and the nature itself of Scripture as a source of Christian faith and the Church. So, Roncalli and Buonaiuti were friends and study companions, and neither of them ever denied this friendship. Here I can reveal a fact no one knows. On September 12, 1960, John XXIII went to visit the summer residence of the Pontifical Roman Major Seminary in Roccantica, in the province of Rieti, Sabina. There, accompanied by his retinue, with the Cardinal Marcello Mimmi, titular Bishop of Sabina and Poggio Mirteto, and other dignitaries, he was welcomed by the Rector of the Seminary, Msgr. Plinio Pascoli and all the students in the small square of the city. A very cordial conversation started there and extended into that serene afternoon. The Pope was happy to be in Roccantica and calmly said this to everyone. He was happy! Next to him among others was Monsignor Pericles Felici, who the Pope had called to prepare the Council. For this reason he had left his position as Spiritual Director of the Seminary. He became Secretary General of the Council from its preparation period until December 1965. Roncalli, happy and serene, spoke at length to the group of young students. In the audience before him, charmed by his talk, one can recognize many of today’s bishops and cardinals. At one point, he stopped to explain why he was so fond of that place. As soon as he became a priest, the day after his first Mass in Rome in the Church of Santa Maria in Montesante in the Piazza del Popolo, he had come to that very place, Roccantica, to celebrate his “second Mass.” He gave all the details of the story: the train had taken him from Rome to Stimigliano station, and from then on the trip was made on a wagon pulled by oxen, some 14 miles of dirt roads, rocks and dust… It was the middle of the summer of 1904. Returning to Buonaiuti, it is also true that when Roncalli taught the History of the Church in Bergamo [northern Italy], he asked the Author to send him the “notes” of the lessons of his friend Fr. Ernesto. But anyone who read this material testified that the notes contained no doctrinal error, and when news got out about this, they did not stop his long “career” – a hard word, but useful – which later, on October 28, 1958, brought Roncalli to the Chair of Peter. The friendship and cordiality lasted all their lives, beyond the harsh and painful events that marked the life of "poor Fr. Ernesto," which actually result from the merciless manhunt against him by the censors of the Church and then of the fascist regime, which deprived him of his professorship at the University of Rome. 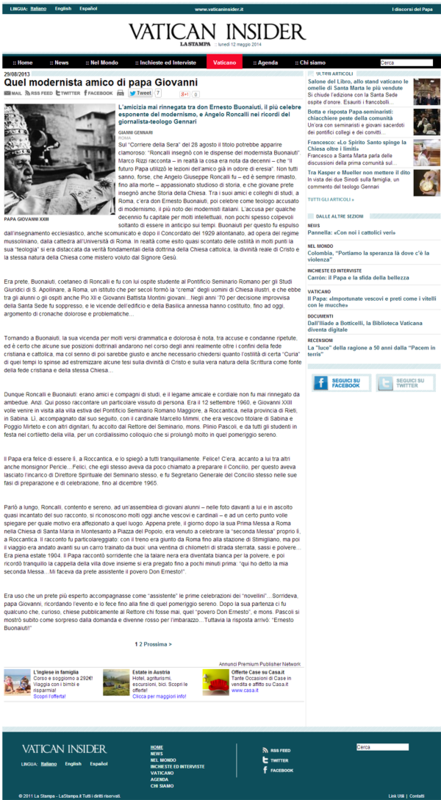 Corriere della Sera reports a "descriptive note" of Paul VI on the diversity of the two, saying: "There is growing esteem for Pope John and compassion for Buonaiuti." Compassion - "montinian" in the truest and strongest sense of the word, which does not imply superiority or hostile judgment, but looks beyond the historical events to see something supreme: divine mercy. This is about Pope John and Buonaiuti, then. In the Corriere article, Marco Rizzi adds that "their friendship has been minutely examined to eliminate any doubt that Roncalli’s orthodoxy had been stained" ... Very true, and to confirm it, it may be useful for me to report another detail that I heard from well-informed persons, although I reserve some doubt. They say that Roncalli, shortly after his election, out of curiosity – one of his most noticeable features – asked someone to go and check the drawers of the then Holy Office to see if there was anything in the files dedicated to him. There was! Among other papers there was a friendly postcard that Buonaiuti had sent to Msgr. Roncalli, who was then abroad, and that the recipient had obviously trashed after tearing it into four pieces. Someone zealous "spy" inside the house or in the Nunciature delegation had pasted the separate parts together and sent it to Rome, as a sign of his dutiful distrust of this Prelate who went – or would go – everywhere, from Rome to Bulgaria, Turkey, France and Venice, leaving everywhere the mark of his proverbial "goodness." Ancient but ever-present ravens. ... A smile! I must correct a non-essential detail, but one that still needs to be corrected, and add a couple of notes to the text above. Archbishop Capovilla reminded me that "the poor Fr. Ernesto," who was Ernesto Buonaiuti, served as assistant priest at the first Mass celebrated by the young Roncalli in Rome in the Basilica of Santa Maria in Montesanto, not at the second, celebrated in the villa of the Roman Seminary in Roccantica, Sabina. In the latter Mass, the "assistant priest" should have been the vice-rector of the seminary, Msgr. Spolvenini, but he did not arrive because he had missed the train from Rome to Stimigliano, and so Roncalli celebrated it without an "assistant." Another note: Mgr. Capovilla has asked me to include that if "poor Fr. Ernesto" had met with less harsh and stiff treatment from the Curia and more "tenderness" – he actually used that word – which now seems more and more important, perhaps his entire story would have been different. He added these two historical facts of his case: Buonaiuti remained unmarried until his death, keeping the promise of priests, and every day until his death he never failed to recite the Breviary, specific prayers said by priests and religious of the Church Catholic ... It is only right to record this. Can a Pope Err in Doctrinal, Liturgical & Canonical Matters?